How to Protect Yourself From Sweepstakes Scammers! Over the last few weeks we have heard about people claiming to be “representatives” of Sweeties Sweeps. This is 100% false! The word “representatives” right away is your first warning sign. No legitimate sweepstakes will use that word when contacting you about a legitimate sweepstakes win. 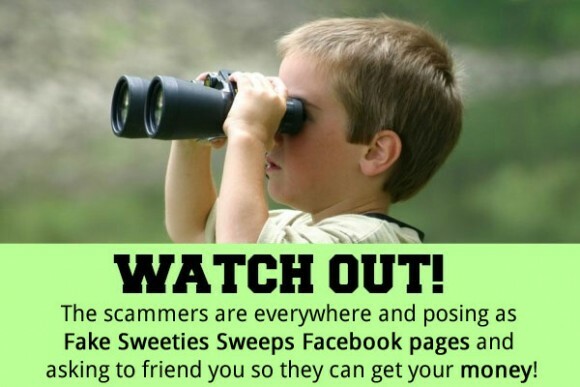 We have also been seeing fake Sweeties Sweeps Facebook pages pop up. If you see them, please let us know so we can report them to Facebook. They are stealing our images from our legitimate Facebook page and putting them up on fake Facebook accounts. When in doubt, ask us on our Facebook, by email, or send Wendy a private Facebook message on her personal page. Always double check friend requests: Don’t just automatically click “accept” for new requests. Take a few moments to look at their Facebook profile and verify that account is a real person, not a scam. Scan your list of current Friends to see if any show up twice (the newer account is going to be the scam one). Watch for poor grammar: Scam Facebook posts are often riddled with typos and poor English or they use words not commonly used in everyday language here in the US. Are they pressuring you to “act now”? Sweepstakes scammers often try to get your personal information as quickly as possible because they know they will get caught so they pressure you to act fast before you lose the prize they are claiming you won. Are they asking for a lot of personal information? Is the prize “too good to be true” or a very, very large amount of money? Yes, you could potentially win $10,000, $25,000 or even $50,000 in cash from a legitimate sweepstakes but large sums of money are a very rare win. If you are contacted about a win this large it will come from a legitimate source – the marketing company who ran the sweepstakes or the company themselves. It will be followed by legitimate information about the sweepstakes including the name of the sweepstakes and the official rules. They will already know your name and possibly address, email and phone because you would have given them some information when you entered. If they are asking you for this information and can’t tell you the name of the sweepstakes or give you a copy of the official rules, that is a HUGE red flag that this is a sweepstakes scammer trying to get your personal information. If you are contacted by someone who claims that you won $850,000, this is a scam! I have never, in my 25+ years of entering sweepstakes, ever heard of a legitimate sweepstakes that gave that extremely large amount of cash away as a prize. The closet thing to this kind of prize is the Dream House HGTV gives away and you would know if you won that because A. you would have entered the HGTV sweepstakes, and B. you would be contacted by HGTV directly. This type of extreme cash win is more like a lottery or casino jackpot win and rarely happens. And, if you won that kind of cash you would have had to participate in some way by buying a lottery ticket or playing at a casino. You will never win that kind of money by entering a sweepstakes. Ask a Sweepstakes friend: Before you ever give out any personal information (address, phone, email, Social Security Number, bank numbers, etc), always ask someone for their opinion. The sweepstakes community is very supportive and someone will help you figure out if what you received was a real sweepstakes win notification or a scammer trying to get you personal information and our hard earned dollars. Never ever give out your bank account number, routing number, or credit card number. Never, ever pay for a prize. Never, ever pay anything up front to get a prize. The only exception is if the company require that you pay shipping for a prize but usually that will be noted in the official rules when you go to enter the sweepstakes. also on paying you may have to pay international taxes if traveling out side the US. I know I had to pay a few hundred in taxes to Mexico when I won a trip there. It will normally be told to you when booking the trip and not paid until you are close to traveling. and NEVER EVER do GREENDOT or Prepaid cards. if they ask for it hang up. and I think the best if its too good to be true and you dont remember entering. Google it see if you can find the contest and verify it. Also on emails if you hover over the link they send make sure it goes to a site it says. double check names of website addresses as scammers will change it so slightly and the websites are clones. they look the exact same. just not the same web address. sekunder om den er lett tilgjengelig og ingen vil varsles.